If you read my recent “Smoothie Spontaneity!” article, then you already know I’m embracing the spice of variety for breakfast. Every Friday I treat myself to a little something different and a bit decadent. This week’s creation: The Pumpkin Pie Bowl. 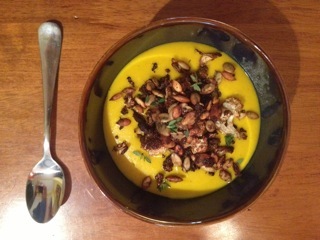 Fall is undoubtedly upon us now, which means pumpkin becomes a ubiquitous ingredient in dishes both savory and sweet. Lucky for me, I happened to have a can of the tasty organic stuff awaiting a creative makeover. Into the Vitamix it went! Everything into the blender… blend, blend, blend! Top with your toppings and spoon this velvety bowl of decadence onto your taste buds. TGIF! * Toppings are, in my opinion, the best part of a smoothie bowl. Mix it up! You may want to try a maple-flavored granola, chia seeds, sliced banana, or even graham crackers for a super pie bowl. Straight from Erin Nichole's Kitchen. This is a three-in-one set of recipes that are sure to please in their present combination, or completely separate. The pumpkin seed recipe yields a hefty amount, which means you can grab-n-go for snacks or add them to other salads and soups. Store your leftovers in an airtight container for maximum crunch factor. The cauliflower is a go-to favorite of mine, and it serves as a worthy side dish companion on any plate. The soup is incredibly creamy and velvety; it’s a crowd-pleaser on its own. The best part of this meal is its simplicity, both in ingredients and preparation. The seeds can be prepared whenever, so I did those a couple of days prior to making the soup. I’d been gradually munching on them ever since. The roasting was easy and I managed to run to the store in the meantime, which meant all I had left to do was blend the soup! This is a great recipe to show off your culinary aptitude to friends, without actually having to try too hard. Let great ingredients speak for themselves! Always strive to buy organic and local. Your mind, body, and local farmers will thank you. * The day before (or morning of) preparing this meal, soak the pumpkin seeds in filtered water for 7 or more hours. So, overnight or while at work is best. Soaking seeds helps the body maximize nutrient absorption while easing digestion. To learn the full range of benefits click here. Start by preparing the seeds. Mix all ingredients together in a bowl. Make sure you’re little seeds are fully and evenly dressed. Pour the contents in a very thin layer onto a parchment lined baking sheet. Bake for 25-40 minutes. Watch carefully as they will burn easily! When done, remove from oven and set aside to cool completely before moving. Prepare the cauliflower by cutting into small florets and discard the stem. Mix all ingredients together in a bowl. Cut the butternut squash in half and de-seed (a grapefruit spoon is helpful here if you have one!). Feel free to save the seeds for roasting at a later time. Set the halves, cut side down, onto a baking sheet. No oil needed. Increase the oven heat to 400°F when seeds have been removed. Bake both the cauliflower and the squash for 30-45 minutes depending on the size of your produce and the hotspots. Look for lightly browned, bubbly exterior skin on the squash to determine when it’s done. When the cauliflower is browned and crispy it’s ready to come out as well, set aside along with the seeds. Allow the squash to cool before attempting to peel it. To prepare the soup, add all ingredients to a high-powered blender or food processor (an immersion blender may work too), and blend or whip furiously until blended into a velvety texture. If the soup is no longer warm, you may want to heat in a small pot on the stove at this point. Spoon soup servings into a pretty bowl, top with cauliflower and seeds to your belly’s content. Sprinkle reserved thyme and rosemary for added taste and color. Enjoy! Recipe inspiration from colder weather, meals made simple with blenders, a love of coconut, and the bloggers of Green Kitchen Stories and Yum Universe. So, There Is Life Beyond French Fries. So. With the support of my co-workers, I’m trying this thing where instead of eating French fries for dinner, I eat salads. I know, totally crazy concept, right? Anyways- this is my first attempt at my new healthy lifestyle (if at some point you see me munching on some Cheez-Its, don’t judge, we all have moments of weakness). In my salad is the following awesomeness: red leaf lettuce, which I just learned about from Spark Co-Owner, John! (I know-who doesn’t know what red leaf lettuce is?! I’ve been living under a deep-fried, carb-filled rock), organic chickpeas (hey, did you know they have protein?! ), organic carrots, organic tomatoes (organic, organic, organic), annnnnd the extra special ingredients- sprouted organic pumpkin + sunflower seeds and organic goji berries (Thanks Sima for the tip!). So basically, tons o’ protein, tons o’ energy, tons o’ happiness- what more could you want from a salad? (Except I probably wouldn’t hate it if there were French fries on top of it but what can ya do.) Dressing is a little bit of rice vinegar and some pepper! So as it turns out, I didn't completely hate it. I think if I keep doing this and make it interesting, I can probably come to love salads...okay, maybe not love but at least stop trying to close my eyes and pretend it's a French fry. Either way, my tummy definitely feels better after eating that salad than it does after French fries (sigh). I’m also using this as an opportunity to prep for the 40-Day Detox (next week) so I don’t completely fall apart on the first day. Sign up for it and we can commiserate together over the lack of French fries in our lives.